You’ve seen it at the Winter Olympics – and now you can play in Atlanta! Curling is a fun, friendly and accessible Winter Olympic sport open to all age groups and experience levels. There are no size, strength or speed advantages in curling which means it’s a level playing field for all participants. One of the cool things about curling is that how you get the stone moving doesn’t matter. Those with mobility issues can use a delivery stick so that they don’t have to get down in the lunge position. That means a stick curler, a wheelchair curler and a hack delivery curler can all play on the same team. Can’t sweep? No problem – we have workarounds for that too. We play in sneakers (there’s no skating) and we provide all equipment. All you have to do is show up and have a great time. Ready to try this crazy fun sport? I want to try curling! Great! 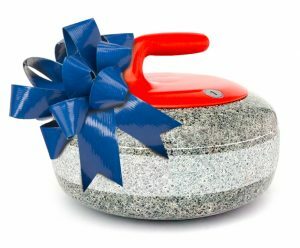 Sign up for our Learn-to-Curl class and you’ll be throwing stones in no time. Class starts with a quick 10 minute off-ice safety talk. Then we move onto the ice as a group to learn how to sweep (10 min.) After that, we break into smaller groups and we’ll guide you step-by-step through the basic skills for delivering a stone and sweeping it into the house (45 min). Once you are comfortable with delivering a stone and sweeping, we pull it all together and play a game consisting of several “ends.” (45 min). By the end of class, you will be fully prepared to join league and play in pickup games. All age groups, physical abilities and experience levels are welcome. One of the great things about curling is that the delivery position is irrelevant. Players can release the stone upright using a delivery stick (no bending required) or launching from the hack. This is a sport that relies on finesse rather than strength or speed – which makes it a true level playing field. Curling is a fun, inclusive and social sport, so feel free to sign up by yourself or bring some friends. There will be plenty of opportunities to take pictures and make your Facebook friends jealous. We play at Center Ice Arena conveniently located just inside 285 on Roswell RD in Sandy Springs. The address is 5750 Roswell RD, Sandy Springs, GA 30342. Center Ice Arena is Atlanta’s newest ice rink. It’s wheelchair accessible and the lobby is a warm room with tables, benches and big windows overlooking the ice. Non-participants can hang out and watch for free. Nothing. All equipment is provided. It can be chilly in the arena (40 – 50 degrees), but curling is an aerobic sport. Some people get hot and some get cold, so please dress in layers. In fall, a hoodie or sweater is recommended. In winter you may also want a hat and gloves. For pants, you want to wear something that you can comfortably squat down in (probably NOT skinny jeans.) Sneakers or similar footwear is required. No ice skates are allowed. In fact, there’s no ice skating at all. Sneakers and loose fitting clothing are all you need. Yup! Take all the pictures and videos you want and post them to facebook or wherever. Curling is a very social sport. After every game we hang out and tailgate (called broomstacking in the curling world.) After class, grab a beverage and hang out with us! We usually have snacks and coolers filled with beer and non-alcoholic drinks. 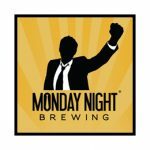 Monday Night Brewing won this year’s Brewer’s Cup and is the Atlanta Curling Club’s official beer of the 2018 – 2019 season. Try one of their beers at broomstacking or go take a brewery tour. What’s the Atlanta Curling Club? The Atlanta Curling Club is a 100% volunteer run, 501(c)3 non-profit. It was founded in 2010 and has provided league play and curling instruction every year since then at multiple locations around Atlanta. The club is built around the idea that everyone should be able to play and enjoy the sport of curling. There’s no trash talking and no one gets yelled at for a missed shot. Games are competitive, but also cooperative. As a growing club, every experienced player helps new players learn the game and develop their curling skills. In fact, our leagues are set up so that each team has a mix of brand new and experienced players, and we specifically reserve spots on tournament teams for brand new players so that they can get the full curling experience. We offer learn-to-curl classes, Fall, Spring and Summer leagues, corporate team building events, and we attend tournaments all up and down the East Coast. Since the 2014 Winter Olympics, we’ve taught over 3,500 people how to curl and we have approximately 110 +/- members of all experience levels. The Atlanta Curling Club is constantly innovating to bring new people into the sport and grow the community. The club implemented a policy of encouraging new players to attend their first out-of-town tournament within their first season or two, and automatically registers teams specifically to bring new players to their first tournament where they will meet other curlers from clubs all over the country. Our social events coordinator established a relationship with a brewpub and we helped them brew and name multiple beers which were on the menu for several weeks. In partnership with our regional organization GNCC and national organization USCA, we hosted a free tournament for our craft brewery friends. We were also a 2018 partner organization of the Atlanta Science Festival and taught students some of the cool science behind what sweeping does, and why the stone curls the wrong way. Thanks to our programs, amazing volunteers and efforts to build a strong community on and off the ice, we’re one of the few clubs that grow membership in non-Olympic years. Our latest project is a LED light installation under the ice which allows the club to have illuminated houses and hog lines without disrupting any hockey lines. This project was conceived, designed and installed in-house by our amazing volunteers. Completed over the summer in 2018, the Atlanta Curling Club and Center Ice Arena now have the first and only permanent under-ice LED lighting system for curling, which provides a unique curling experience. The Atlanta Curling Club is very active off the ice. We hold monthly off-ice activities including brewery tours at most of the local craft breweries, entered a Rock Paper Scissors tournament (with a 2nd place win! ), bowling nights, team trivia, annual picnics, watched the Atlanta RollerGirls, brewed curling themed beer at brewpub Slice & Pint in Decatur and we started our own in-house homebrew club ACHAC (Atlanta Curling Homebrew Adjunct Club).